In the film classic "The Empire Strikes Back," the iconic Jedi master Yoda inscrutably refers to "the Force" during training sessions with his disciple, Luke Skywalker. Yoda informs Luke that he "must feel the Force around you." Yoda himself is frequently seen assuming what may only be described as intergalactic yoga poses. Elsewhere in the film, Luke offers this Jedi-type benediction to the departing Lando Calrissian and Chewbacca, the Wookiee: "May the Force be with you." The Force, whether we conceive of it as a benevolent intelligence or a life-sustaining and life-affirming energy field, is all pervasive and only to be ignored at our peril. Even if we consider the Force merely metaphorical, we can still take action to enhance our connection to the life-sustaining forces in and around us. Taking care of our bodies is an important part of accomplishing this goal. We do this by engaging in healthy lifestyle behaviors and choices, of which eating a nutritious diet, performing 30 minutes of vigorous exercise five days a week, and getting sufficient restful sleep at night are the three primary endeavors. In the realm of exercise, the key is not so much the specific type of physical activity, but the fact that you're doing exercise itself. The short- and long-term benefits derive from the consistency of your efforts, that is, your ongoing commitment to and accomplishment of the above mentioned 30 minutes of vigorous exercise five days a week. Naturally, we'd like to obtain the maximum advantage from the time we're spending exercising. 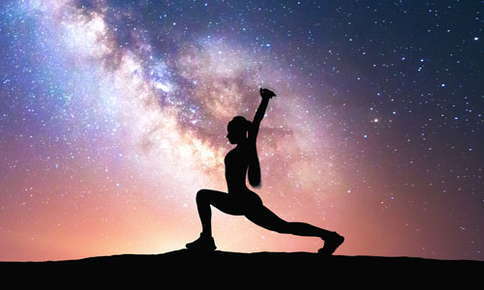 Yoga is one exercise format that provides a substantial return in multiple areas, including cardiovascular, strength, and endurance benefits. For example, over time, practicing yoga can help lower your heart rate and blood pressure, lengthen and strengthen large muscle groups, and improve balance and concentration. Regular chiropractic care helps us get the most out of our yoga practice as well as all other forms of exercise. Regular chiropractic care helps make sure our spine is aligned and that all the spinal vertebras, spinal joints, and spinal muscles and ligaments are working properly and effectively. By detecting and correcting sources of nerve interference that interfere with function and mobility, regular chiropractic care helps us stay well, perform at our physical optimum, and obtain the greatest benefit from our healthful lifestyle activities. In this way, regular chiropractic care helps improve our overall health and well-being and that of our families now and in the years to come.